When it comes to repeated beauty maintenance I’m pretty rubbish. I want something to work instantly and then take whatever problem away and never come back. Clearly if this was how products worked then I wouldn’t still be trying things, and wouldn’t have much of a blog to write. Anyway, since I am still writing this blog I will continue to bring you products that I have tried and liked (and some that I don’t like of course) and here is another one that I’m really impressed with. 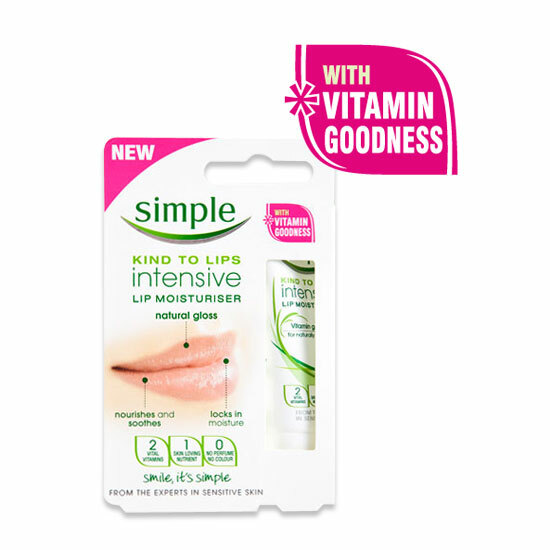 It’s just an intensive lipbalm from Simple – but I’m really loving it. My lips, like most of my skin is prone to dryness. Downside with lips is that when lips get dry they tend to get less plump, drier and can age the face. Not what I need! So I dug out this lipbalm, happened to apply it one day and really liked it – it feels lighter than vaseline and that it’s actually managing to both soak in and create a barrier layer for lips. Once applied it stayed on the lips for ages – major plus points. But when it really impressed me was when I applied right before going to sleep. I think giving it overnight to work it’s magic really made the difference – I swear my lips felt plumper in the morning and softer and smoother. More plus points. The other thing I like is that it’s actually getting there with my demands for applying and then that’s it. I haven’t applied this lip balm for a couple of days and my lips still feel soft and lovely. So there we have it. It’s a basic – but one I will keep by the bed and definitely buy again when I run out. I love discovering products like this. I love simple products that just works! I really don’t need some super-duper-oh-so-scientific-dream-potion to put on my lips. I just want them moisturised and plump, and that’s it. Try Intensive Moisturiser by Blistex; it’s not petroleum based, it’s extremely moisturising, stays on for ages, works overnight similarly to what you described above, slightly tingles and the taste is very inoffensive. Plus it’s cheap as chips, I adore it. its awesome finding products that work, especially when they are cheap. I don’t think they sell that here in canada though.